Fleets will be a more central and fundamental part of the Star Trek Online experience, with particular focus on End-Game. Every Fleet will start with its own instanced system map with a Starbase exterior under construction. The Starbase interior and exterior will grow in appearance and functionality as you contribute to your fleet. Fleets are an entirely new advancement system, allowing Fleet members to collaborate together to overcome new challenges for new top-tier rewards. Fleet advancement is designed for Fleets of all sizes and styles of play. Fleets can develop their Starbase how they like – focusing on Military, Engineering and Science depending on the direction of the Fleet leaders. Having a Fleet grants you access to new group space and ground challenges, including the active defense of your Starbase. In pursuit of this defense, developing your Starbase will also provide you with new powerful consumable devices called Operational Assets that can be only be used in these special challenges. Fleets member can gain access to a whole array of new top-tier rewards including new starships, new equipment, costume options, new consumable Operational Assets, and more. Fleets can improve their Starbase interior with special contacts and functionality such as bank access, ship dock facilities, Sickbays, contacts, cosmetic upgrades, and many other additions. • Adding new functionality to your Starbase such as the ability to repair ships or open Transwarp gates to distant sectors. • Adding new contacts to your Starbase interior that allow for useful functions such as additional duty officer assignments, mail, banking, skill respec, bridge officer training and many other functions. • Add limited numbers of new ships or other elite equipment to Fleet stores. • Aesthetic improvements to your Starbase. Fleet Officers will assign the specific Fleet Projects that they want the Fleet to focus on. Some of these will be gated by the Starbase’s development in each of the three major categories (Military, Engineering and Science), but others will be available only at certain times with unique rewards for those Fleets who are able to complete their strenuous requirements. Contributing to a Fleet Project will reward the Fleet member an amount of Fleet Credits commensurate to the contribution. All Fleet stores will accept Fleet Credits for new unique ships, weapons, duty officers and other specialized equipment. As a Fleet’s Fleet experience points in each of the three categories grow, the categories will improve in tier from Tier 0 through Tier V. As a Starbase’s Military, Engineering and Science categories improve in tier, new Fleet Projects will become available to the Fleet. Improving a Starbase in each of these three categories will also improve the defensive capabilities of the Starbase, a useful function during the new Starbase defense challenges. 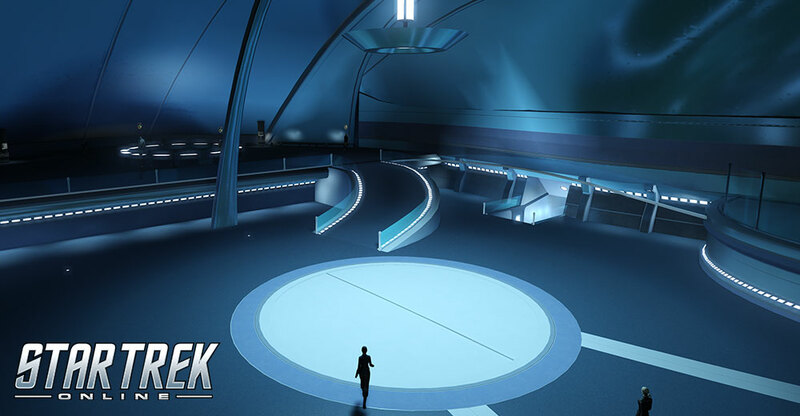 With each improvement in a category’s tier, associated Starbase facilities in the same system as the Starbase will improve. For example: increasing a Starbase’s Military tier will develop the system’s Shipyard facility; increasing a Starbase’s Engineering tier will develop the system’s Industrial Replicator; and increasing a Starbase’s Science tier will the system’s Communications Array. These facilities both represent strategic vulnerabilities during Starbase defenses, but also grant the Starbase additional functionality and access to new Fleet Projects. As a Starbase’s Military, Engineering and Science categories improve in tier, the Starbase overall will improve, unlocking additional Starbase functionality and increasing the size and grandeur of the Starbase itself. Just like each category (e.g. Military, Engineering and Science) having five tiers of development, so too does the overall Starbase development range through five additional tiers of development. As a Fleet develops its Starbase, its importance increases and it will face continued challenges and be forced to defend it against attack from an increasing selection of enemies. Starbases will also feature unique daily missions available to their members for rewards that will further contribute to the development of the Starbase. 1. Gather the resources necessary for various Fleet Projects. 2. Individual members contribute resources to a Fleet Project, gaining individual Fleet Credit commensurate to the individual’s contribution. 3. When a Fleet Project meets the resource requirements, it will begin building, whereupon the next queued Fleet Project will become available for contributions. 4. When a Fleet Project’s build time completes, the effects of the Fleet Project will appear; in addition to Fleet experience points in the related category, these effects may include buffs, limited quantities of unique ships and equipment in Fleet stores, new contacts and functionality on the Starbase interior, improved Starbase defensive capabilities, and other possible effects. 5. When enough Fleet experience points have been accrued in one of the three categories (Military, Engineering, Science) to attain the next development tier for that category, special upgrade Fleet Projects will become available. 6. Completing one of the special upgrade Fleet Projects will advance the associated facility (Shipyard, Industrial Fabricator, Communications Array, or the Starbase itself) to the next tier. In addition to your Starbase, there are other Fleet Holdings that are available for advancement. The main benefit to the Dilithium Mine is that upgrades offers Dilithium discounts to all other Fleet Holding projects, allowing fleets to upgrade other holdings even more quickly and efficiently. The Mine also includes Duty Officer assignments and personal Mining to help individual players refine more dilithium. The Fleet embassy is a Romulan themed Fleet Holding located on New Romulus. Upgrading the Fleet Embassy allows Captains to obtain Romulan Bridge officers, Duty Officers, and Romulan themed gear. Duty Officer Assignment slot upgrades are also available, which permits Captains to run more assignments. The Fleet Spire is located in the Dyson Sphere Adventure Zone, and its upgrades impart bonuses to all Captains within the Fleet as they fight within the Dyson Sphere. Duty Officer Active Roster slot upgrades are also available in higher tiers. The Fleet Research lab is Krenim themed, and thusly contains gear focused on time manipulation. Special R&D Assignments are available that give bonus experience, which helps advance an individual Captain’s R&D skills more quickly. There are also weekly bonus projects that can be completed which impart benefits to everyone in the fleet.